DON'T TRY TO REINVENT THE WHEEL!! The 420 is an international class sailed in 67 countries. It is the ideal boat for young sailors ready to move on from junior classes such as the Optimist, Flying 11, Minnow, Laser 4.7, Open Bic and Sabot. You can form a great 420 team from 2 sailors of similar weight, age and skill. The competitive combined weight range of helm and crew is 105-130 kgs. The boat introduces sailors to true teamwork because the helm and crew equally share the trimming, ergonomics, tactics and strategy to get the best performance from the boat. Both the helm and crew actively trim sails upwind and down. Upwind the helm hikes, steers and trims the mainsail just as they did in their junior class, while the crew actively trims the jib, trapezes, and provides tactical information to the helm from their higher viewpoint. Downwind it's game on for the crew who learns to combine the skills of trapezing, jib trim, spinnaker trim and spinnaker pole handling. It is no coincidence that Peter Burling, Nathan Outteridge, Ian Jensen, Kyle Langford, Matthew Belcher, Ayden Menzies and many other current leaders of sailing all mastered the 420 on their way to fame! This little boat gave them the right foundation to build upon and move successfully into 49'ers, Moths... and AC 50's! Importantly, the tactical style of racing in 420s is the same as what works successfully in the junior classes. The boat tacks and gybes with almost no loss of speed and distance - so the racing style is not about minimising manouvres in search of a layline - in 420 racing you will build upon the tactical smarts you already have and come out of the 420 an excellent tactician with a very solid tactical style of sailing. The 420 offers great development for sailors in the two-handed disciplines – it has helped create the top 470, 49er and 29er sailors in Australia and in the World. To learn your trade as a helm or crew it is great to do this in the 420! Some young sailors may never be big enough to sail a Laser Radial or other single-handed international class, or may take a longer time to grow, so getting into the two-handed classes via 420 makes sense to develop your skills and keep future options open. 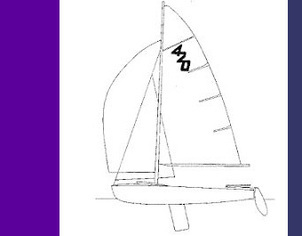 Unlike Opti’s, most boats you will sail in the future will have downwind sails. 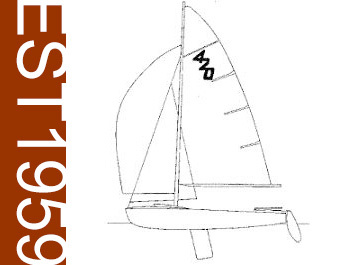 The 420 is an ideal platform for learning about tuning a boat and the consequences of tuning, teaching in a relatively simple way the trimming of sail combinations (i.e. main, jib, spinnaker together) like no other boat can. This is great for all your future sailing, not just two-handed. The 420 is a stable boat to sail which planes upwind easily, the trend in modern yachting. It will teach you how to sail in an environment of partnership with your crewmate, adding another significant element to your development as a sailor (and as a person).